Click here to receive Aakash Mittal's email newsletter. 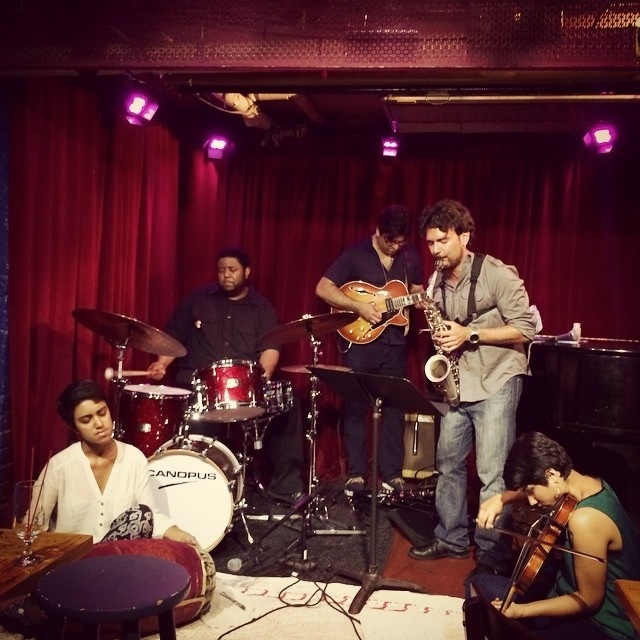 ​Congratulations to Aakash's Awaz Trio for a powerful night of music at Brookyn's Firehouse Space December 17th. You can read a great review of this amazing show here. Today, Aakash's final essay was released for NewMusicBox. In it, he discusses ideas about how the cultural and universal collide within art. Be sure to check it out and catch up on his three preceding essays in the series. The four essay, entitled "Questions of Identity," can be found here. ​Aakash is excited to announce the release of his third essay for NewMusicBox. In this piece, he explores some of the roles that biology plays in music making as well as the quantum process of creativity itself. Much of this revolves around the experience he's had studying with Milford Graves in New York City. Click here to read his essay. Congratulations to Aakash and the Brooklyn Raga Massive for their first performance at the David Rubenstein Atrium at the Lincoln Center. They performed a beautiful, energetic, and powerful concert to a packed audience. Before the show, the line wrapped around the building and their performance of music ranging from Hindustani classical, African, and Jazz music ended with a standing ovation. Aakash's second essay is now on the NewMusicBox website! 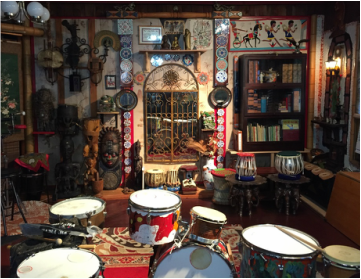 Click here to read Aakash's thoughts on music and his experiences living in Kolkata entitled, "Street Music, Noise, and the City of Joy." ​Aakash is excited to share his first published article, which can be found here on the NewMusicBox website. Learn more about how Aakash's work with Hafez Modirzadeh inspired him to move beyond ethnic stylizations and find the universal music in his own playing and composition. He looks forward to reading your thoughts and comments on the blogpost. ​Here, Aakash conducts the Sound Bite Orchestra as they play Distractions by Conrad Kehn for their final concert of the season. This is one of two orchestra's Aakash conducts for Face the Music, the nation's only organization of youth orchestras solely dedicated to playing music of living composers. Keep an eye on the events page for Face the Music's 2016-17 season. ​Aakash performed with Samir Gupta on drums and Rez Abbasi on guitar at Brooklyn Raga Massive. 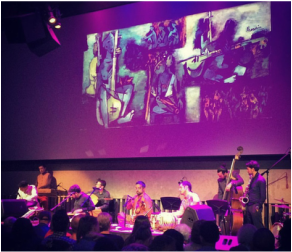 BRM is NYC's platform for lovers of raga music. The Awaz Trio is seen here playing Aakash's original music. Aakash Mittal and Julius Schwing first collaborated at the Banff workshop for creative music in Canada. 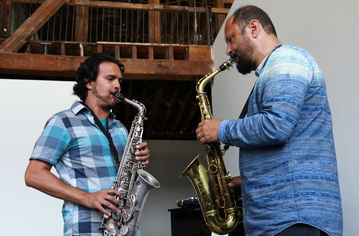 Under the tutelage of esteemed composer and saxophonist Hafez Modirzadeh, the duo wrote a number of pieces drawing from microtonal maqam tunings and exploring intervallic colors. Schwing and Mittal met up again in Kolkata, India in 2014 for a series of performances and to expand their repertoire. (Julius is pictured at the top of this page on the far left.) Now they are revisiting these compositions in New York City with the added voices of Carlo De Rosa on bass and Alex Ritz on drums. For details on the show, click here. Last week, Aakash sat in on a few tunes with Lynn Baker's band at the Mercury Cafe in Denver. Do you miss hearing Aakash in Colorado? Don't worry! Aakash will be playing at Dazzle, Denver's premiere Jazz club, on September 3rd with Marc Sabatella. Marc is an incredible pianist and this is sure to be a night of live music you won't forget. Hope to see you there! Aakash has finally returned home after his long stretch studying Hindustani music in Kolkata, India. He hopes to see you for his first performance back in the states on Sunday, April 26th at the Shastra Festival in New York City. In addition to a performance by the Awaz Trio, Aakash's newest project featuring Rajna Swaminath on mridangam and Rez Abbasi on guitar, Face the Music will be premiering a new work by Mittal commissioned just for the festival. For more information including tickets, times, and location, click here. Aakash joined the Oam Trio featuring Matthias Muller on guitar and Aniruddh Saha on drums at Kolkata's Plush Lounge for a great night of improvised music. Thanks to everyone who came out! If you missed it, Aakash will be playing at Plush again on March 19th for another amazing show. Hope to see you there! Aakash joined Kolkata based Brahmakhyapa at Jamsteady to raise funds for the Kashmir Relief Fund. He'll be playing with them again on February 22nd at a festival outside Shantaniketan in West Bengal. Here's a clip from the show featuring Sanjoy Bhattacherjee on guitar, Malabika Brahma on vocals, Tatai Bhattacharya on bass, and Gabu Chatterjee on drums. This is a Baul song, which is folk music from West Bengal. Click here to read an article on the event, which includes a photo of Aakash! Aakash joined The Bottesini Project, Colorado's premiere free improvisation ensemble, in the recording studio today. This project features Colorado natives Paul Riola, Glen Whitehead, Kim Stone, and Jay Ellis. Check back for updates on the album and Aakash's involvement. Tonight is the opening night for Mudra Dance Studio's production of Gyaan: Truth through Knowledge in Denver. This is an amazing project that I have been working with through the summer. I am excited to be featured with a number of improvisations and composed melodies in this work. If you are able to make it please let me know and I will come say "hi" at intermission. For more information about the production, please click here. For more information on everything I am doing including details of other upcoming performances, please click here. Finally, I want to say a big thank you to everyone to attended the Colorado premiere of the Awaz trio earlier this month. It was wonderful to share this music with my Colorado community. I am excited to bring my latest project, Awaz Trio, to my Colorado community. The conception for Nocturne began nine years ago during my undergrad at CU Boulder. I was inspired by the Indian concept of rasa, the literal evocation of emotion through music and dance, and time theory, the idea that certain ragas communicate specific times of day or night. I knew then that I didn't have the skills or knowledge to even begin such a project. I predicted that I wouldn't start until I was at least thirty. Right now I am twenty nine so I guess the prediction was accurate. My recent year long fellowship in India gave me the opportunity to have an authentic experience with Hindustani raga music and the space to explore this idea for the first time. This is also my first project to incorporate traditional Indian percussion in creative improvised and composed music. In many ways I feel I am only just beginning to sculpt this idea into sound. The musicians I am collaborating with have cultivated their own original voices stemming from a diversity of traditions. Matt Fuller is a Brooklyn based guitarist whose sound emanates the western slope and jazz language. Rajna Swaminathanalso hails from New York City and is doing ground breaking work creating a space for the south Indian hand drum, called Mridungam, in improvised music. Please join us for a night of creative music. The sounds of West Bengal will collide with Carnatic ragas and New York City beats to create music that is at once steeped in tradition and distinctly modern. Join Aakash and the rest of the Awaz Trio at 6:30 pm to promote their upcoming performance at Dazzle, Denver's premiere jazz club. Aakash will also be talking about his experiences in India and the inspiration for his newest pieces, including Nocturne. Listen on air at 89.3 FM Denver or visit kuvo.org to stream the interview. Rez Abbasi to a sold out audience. The quintet performed new compositions, by Aakash and Rajna, that explored improvised forms and abstracted ragas. Welcome to the Aakash Mittal Music newsletter! Jayanthi and I made it safely home to the United States. We have been feeling a bit of culture shock and have been enjoying all of the food, music, and people that we missed while abroad. I am excited to be debuting a new project called Awaz Trio that features Matt Fuller playing guitar and Rajna Swaminathan playing mridungam. We are giving a number of performances on the east coast and in Colorado premiering my AIIS project Nocturne. This trio is a dynamic development in my goal of pursuing a sound that expresses the night through reconciled traditions. Please join us at one of these performances so we may share this project with you. I will be giving my first performance at an established NYC music venue on August 5th at Cornelia St. Cafe. In addition to that I will be playing with my long time musical heroes Rez Abbasi and Tyshawn Sorey along with my friends Rajna Swaminathan and Anjana Swaminathan. Please wish me luck and if you living on the east coast please listen to the music. In late September I will be performing in Gyaan with the Mudra Dance Company in Denver. This project will be utilizing Kathak and modern dance styles to make a statement about loss and healing in our society. I am thrilled to be part of such a wonderful band of Denver musicians. To help fund the project Mudra is doing a kickstarter campaign. If you are interested in checking it out please click here. Thank you for supporting Jayanthi and me during our adventures in India. We have many more exciting projects and concerts in the works so please stay in touch.